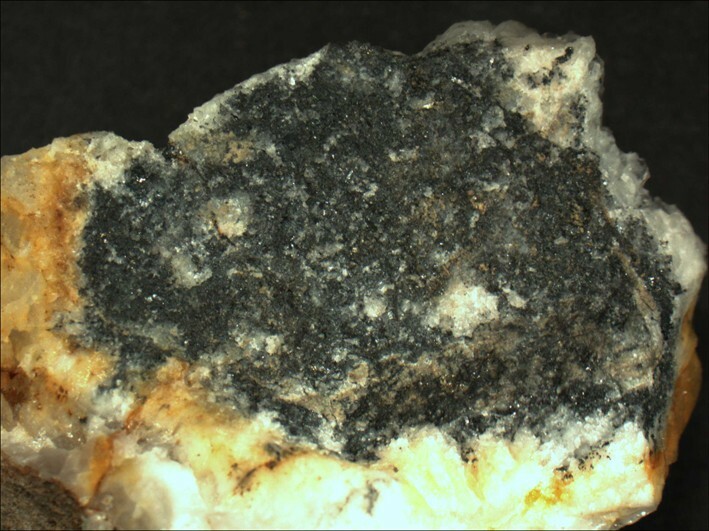 Mckinstryite: Mineral information, data and localities. For Hugh Exton McKinstry (1896-1961), Professor of Geology, Harvard University. 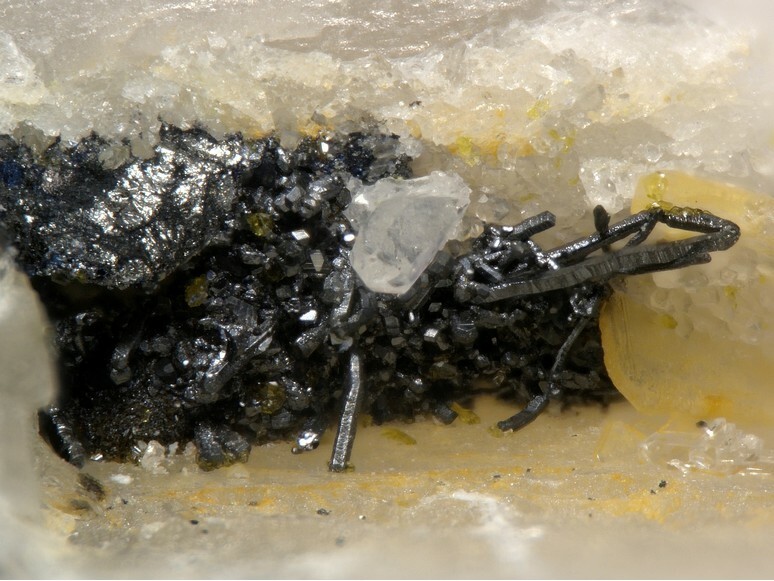 Low-temperature sulphide, often associated with the chemically related stromeyerite and jalpaite. Formula previously given in a simplified way as (Ag,Cu)2S, now revised to ~Ag5Cu3S4 on the basis of a crystal structure solution (Kolitsch, 2010). Strong in gray, pale grayish blue and light tan. Cell data for type material. Vaterite 1 photo of Mckinstryite associated with Vaterite on mindat.org. Jalpaite 1 photo of Mckinstryite associated with Jalpaite on mindat.org. Stable below 94.4 degrees C.
Djurle, S. (1958): X-ray study of the Ag-Cu-S system. Acta Chemica Scandinavica, 12, 1427-1436. Skinner, B.J. (1966): The system Cu-Ag-S. Economic Geology, 61, 1-26. Skinner, B.J., Jambor, J.L. and Ross, M. (1966) Mckinstryite, a new copper-silver sulfide. Economic Geology, 61, 1383-1389. American Mineralogist (1967): 52: 1253. Robinson, B.W. and Morton, R.D. (1971): Mckinstryite from the Echo Bay Mine, N.W.T., Canada. Economic Geology, 66, 342-347. 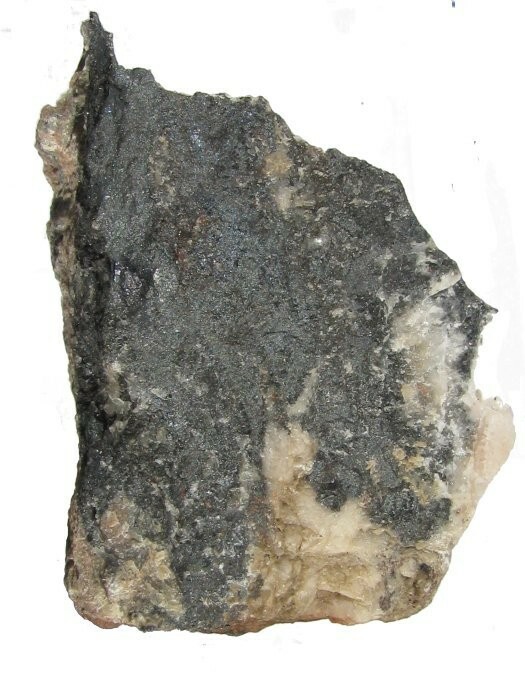 Yarenskaya, M. A.; Kostogonov, V. G.; Muratov, E. M.; Slyusarev, A. P. (1975): First find of mackinstryite in the USSR. Zapiski Vsesoyuznogo Mineralogicheskogo Obshchestva 104, 62-65 (in Russian). Pekov, I.V. and Karpenko, V.Yu. (1996) Unusual stromeyerite-mckinstryite pseudomorphs after dyscrasite in the Sarbai deposit of northern Kazakhstan. Vestnik Moskovskogo Universiteta, Seriya 4: Geologiya, (6), 45-50 (in Russian). Schmidt, J.A. and Sagua, A.E. (1999) The chemical diffusion coefficient of silver in Ag1.2Cu0.8S (-phase) determined by the potentiometric method. Anales de la Asociacion Quimica Argentina, 87, 111-120. Kolitsch, U. (2010): The crystal structure and compositional range of mckinstryite. Mineral. Mag. 74, 73-84. Atanasov, V. and Lavrentiev, Yu. (1973) New occurrence of mackinstryite. Spisanie na Bulgarskoto Geologichesko Druzhestvo, 34, 309-320 (in Bulgarian). ; Anthony, Bideaux, Bladh, Nichols: "Handbook of Mineralogy", Vol. 1, 1990; Atanassov, V.A. and Kirov, G.N. (1973): Balkanite, Cu9Ag5HgS8, a new mineral from the Sedmochislenitsi mine, Bulgaria. American Mineralogist, 58, 11-15.; ATANASSOVA, S. THE PRESERVED MINERAL DIVERSITY OF SEDMOCHISLENITSI DEPOSIT, VRATSA ORE REGION. Robinson, B. W. and Morton, R. D. (1971): Mckinstryite from the Echo Bay Mine, N.W.T., Canada. Economic Geology 66, 342-347. SKINNER, B.J., JAMBOR, J.L. & ROSS, M. (1966): Mckinstryite, a new copper-silver sulfide. Economic Geology 61, 1383-1389. Dana 7:I:343. U. Kolitsch, J. Gröbner, F. Brandstätter and R. Bayerl (2010): Neufunde aus der Grube Clara im mittleren Schwarzwald (IV): Calcioandyrobertsit, Cotunnit, Gerhardtit, Khaidarkanit, Lukrahnit, Mckinstryit, Moolooit, Rhabdophan-(La), Rouait und Uricit. Lapis 35 (9), 22-27; 62 (in German). The Canadian Mineralogist Vol. 41, pp. 185-200 (2003); Syafrizal; Imai, A.; Motomura, Y.; Watanabe, K. (2005): Characteristics of gold mineralization at the Ciurug vein, Pongkor gold-silver deposit, West Java, Indonesia. Resource Geology 55, 225-238.; Yuningsih, E. T., Matsueda, H., & Rosana, M. F. (2014). Epithermal Gold-Silver Deposits in Western Java, Indonesia: Gold-Silver Selenide-Telluride Mineralization. Indonesian Journal on Geoscience, 1(2), 71-81. Simpson, M. P., & Mauk, J. L. (2011). Hydrothermal alteration and veins at the epithermal Au-Ag deposits and prospects of the Waitekauri area, Hauraki goldfield, New Zealand. Economic Geology, 106(6), 945-973. Bakhsh, R. A. (2018). Microanalysis and genesis of Cu-Ag minerals in metadiabase dykes at the Jabal Zalm area, Saudi Arabia. Ore Geology Reviews, 95, 713-724. Bakhsh, R.A. (2018): Microanalysis and genesis of Cu-Ag minerals in metadiabase dykes at the Jabal Zalm area, Saudi Arabia. Ore Geology Reviews 95, 713-724.
ⓘ Gold Crater District ?